A man’s strength and well being lay in the arms of happiness, according to China’s ancient philosopher and founder of Taoism, Lao-Tzu. For him, a person would continue his constant struggles when he fails to uncover and cherish happiness. No one could rule others unless he learns to rule the heart. Learn to listen to your heart. It holds the answers to your questions. Follow its voice. Never cast aside the answer it gives you in favor of fantastical outcomes, for it rarely becomes a reality. When you learn to listen to your heart, you overcome every challenge that may come your way. Be not fixated on the destination. Where you’re headed doesn’t matter. What matters are the lessons you learn along the ups and downs of the highways and byways of life. If you enjoy the journey, you’ll get more out of the experience. Before you knew it, you have arrived to your right destination. 3. Live life in simplicity, patience, and compassion. Try to live a simple life. When you look at it deeply, you find it’s a straightforward reality. Complexity yields anger and frustration. Simplicity leads you to what matters most. Be patient in all your undertakings. Impatience distorts your inner peace. Have compassion for others. Every good thing you do for them will come back to you ten folds. If you live simply, patiently, ad compassionately, happiness will manifest itself to you. They say you speak the most when you keep silent. Do it when needed. At times, it may be the smartest thing to do. Try not to speak ill of others as well. If you find something that can demean others, refrain from saying it. It wouldn’t help to either of you. For you do not know everything behind what you seem to know. Welcome the power of silence and use it to your own advantage. This way happiness is at your side. 5. Wait for the right action to take. Don’t grab the opportunity for a dramatic change. Wait. Listen. Settle. Take the appropriate action when things get clear. Learn to stick through the hurdles. It may be that holding on is the best action to take. 6. Never expect something in return. If you have the will to do something for others, do so without expectations. Your actions shouldn’t be measured by what you receive in return. If you’ve done something good for others, don’t expect for praise. You’ll never lose anything when you give without expecting anything in return. This brings you greater happiness. 7. Have a joyful soul. When your soul is joyful, you emit frequencies that can make the universe sings with you. You create music that reaches the ears of the stars. Everyone around you will benefit from your joyful soul. It may even be possible that the music your heart creates could heal anyone from their sufferings. Sometimes we think we deserve a much better treatment. A harsh reality is, others are rude. Yet in most cases, it has nothing to do with us. It has something to do with them. The best way to respond to another’s rudeness is to understand them. Maybe they need to be reminded of their own niceness. Most often, the gift of niceness is the only key that could unlock a person’s bolted emotions. Rise up to every situation. When you do, you’d be happy because guilt is not on your side. Take into heart these eight ways and incorporate them into your daily life. 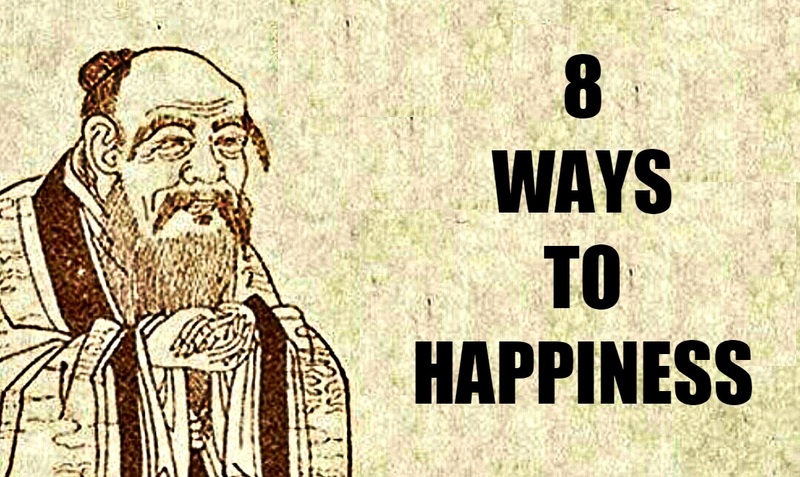 Lao-Tzu spent his entire life unraveling the mysteries of life. These ways were critical to him in a person’s well-being. If followed rightly, your life would be filled with everlasting happiness.